Undaunted.Life: A Man's Devotional - Can I be manly and spiritual? How can I serve God with my mind? Is my physicality an act of worship? How can Jesus be the Lion and the Lamb? 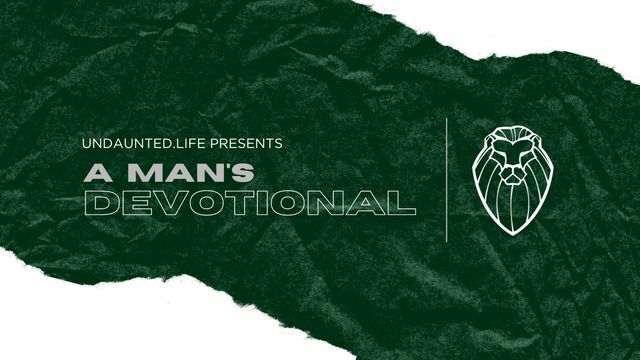 In each of the weeks of this 21-day men’s devotional, you will answer these questions while learning how to cultivate manly resilience in three key areas: spiritual, mental, and physical. Many are familiar with the Lamb of God... We will seek the Lion of Judah. NOTE: This devotional is not for the typical church guy, the weak-willed, or the soft-minded. Most men want to live a life devoid of fear. We want to have power and toughness that begets leadership, respect, and adoration. To live undaunted, you must not shrink or become intimidated by discouraging circumstances. For our purposes, we will focus on three elements of an Undaunted.Life: spiritual, mental, and physical resilience. The first element of an Undaunted.Life is to have SPIRITUAL resilience. All of the elements are important, but this one will be the driving force for a holistic approach to a full life. In order to live an unflinching and audacious life, men must be strong in spirit. So, imagine that you are wandering the countryside. You are depressed. You are lonely. To top things off, you are living in a cave. Not a pretty picture, is it? This is the exact state of affairs that we find the mighty David in here in Psalm 34. Now, the interesting thing here is that you would think that his writing during this period would be wrought with dark commentary. Instead, he is faithful and praising. During this period in Palestine, there were many lions wandering the region. It is very likely that some of these lions were prowling the same hillside and exploring some of the same caves that David and his posse called home. In verse 10, David uses the example of a young and powerful lion to describe man’s self-reliance. This means all the more coming from a man who had scraps with these formidable creatures and came out the victor. David is trying to tell us that even these incredibly dominant, resourceful, and majestic animals will certainly suffer from hunger and cravings at some point. Even the most powerful of the most powerful will be found wanting; they will find themselves in desperate need. David’s circumstances may warrant panic or despondency, but instead he is undaunted. He is praising God for his glory and power all the more during this dark period. He is undaunted because he knows exactly where he falls short and exactly where God will pick up his slack. The lesson for men here is simple: Don’t try to go it alone… You have to depend on God and the body of Christ. You will not get to where God wants you to be by your own grit or might. You will always fall short. But how great is it to know that you do not have to have all of the answers and strength? So, what is it for you? Are you in a dark season of life where giving up or just floating along seems attractive? Are you at a point where your dogged self-reliance and competitiveness has choked God out of your life altogether? Can you see where your attitude about life and work has made you a social pariah? How can adopting the outlook and attitude of David in Psalm 34 help you as you go through life’s trials?